Cost of tile installation vary from $4.60 to $17 + per square foot and will be determined by a number of factors. $9.50 + / Sq. Ft.
1 Tile installation prices were calculated accounting 200 ft2 minimum job order. Smaller projects will be priced at a higher rate and won’t be quoted as tile installation cost per square foot. Average labor cost of tile was estimated based on standard installation excluding preparation work and installation of backer boards. 2 Difference in cost to install tile indicates you savings or how much more in % you should expect to pay for different types of tile installation in comparison with a cost to install porcelain tile. Due to distinction variations in work complexity and diversity in dimensions as well as materials tile made of tile settler will issue an itemized estimate with detailed cost analysis only after onsite inspection. Does the tile grouting will be included in the cost to install tile? Grout application is a part of tile installation process and the cost has to be included in the price quote you will get from a tile contractor. Does the sealing of tile or grout will be included in the cost of tile installation? Any stone tile will require periodical sealer application after tile installation. First time tile installer will apply sealer on the tile and grout at no additional cost, but in a while after installation it is a responsibility of homeowner properly maintain the tile. Because of huge variety of tile products available the price for installation differ significantly. Installing 12” x 12” ceramic tiles on the wall normally cost $5.45 - $5.80 per sq. ft, but at the same time glass mosaic tile installation might double or even triple the price. Stone tile such as granite or marble much more expensive to install and bathroom remodeling cost might increase significantly if choosing pricy tile options. Most contractors will charge small tile installation projects at higher rate. For example, price for the installation of 45 sq. ft. porcelain floor tile in a small hallway will be around $450 to $550, which makes it $11.25 - $12.30 per square foot. But if it is a 700 ft2 basement has to be tiled with the same porcelain tile, an installer typically offers much better deal on labor per square foot and will price the project at $2,800 - $3,100 or $4.0 - $4.4 per sq. ft.
Design and layout will have significant impact on the tile installation prices. Usually cheapest option is a strait layout with a minimal cutting require. Installation of borders, medallions, mosaic, building shelves in the shower or any other custom elements will lead to adding extras to gross labor expenses. Also installation of tile on walls or ceiling will be more expensive than on the floor. The same as with any other project, if you live in the area where living expenses are higher, most likely, you will pay for tile installation higher price. But even in the same city prices will vary. In residential house with easy access and no associations’ requirements you will not pay any extra charges. Prepare to extra fees for tile installation if you live in an apartment building with an elevator, no free parking and certain association requirements. Hiring local handymen is the most cost effective solution unless you are considering do it yourself. But while looking for the biggest savings and making a decision based on least expensive estimate always make realistic expectations about work quality. There are a lot of small companies which specialize in tile installation and can do really good work without overcharging. Most of bigger home improvement retailers also offer installation of their products. They are usually charge more and tile has to be bought from them. But good thing they can offer financing if you cannot afford to pay whole amount right away. Big contractors or construction companies might not a cheap option and typically worth to consider if tile installation is a part of a whole home remodeling project. It is easier to price tile installation on a new construction where everything is much more predictable, but if it is a home improvement project prior in home inspection require for estimating the project accurately. 14" x 14" - 24" x 24"
$3.80 - $4.00 / Sq. Ft.
$4.00 - $4.40 / Sq. Ft.
8" x 8" - 13 ¾" x 13 ¾"
$4.40 - $4.90 / Sq. Ft.
$4.90 - $5.20 / Sq. Ft.
6" x 6" - 7 ¾" - 7 ¾"
$5.20 - $5.70 / Sq. Ft.
$5.70 - $6.30 / Sq. Ft.
2" x 2" - 5 ¾" x 5 ¾"
$6.20 + / Sq. Ft.
$6.70 + / Sq. Ft.
$4.30 - $4.70 / Sq. Ft.
$4.70 - $5.20 / Sq. Ft.
$5.20 - $5.80 / Sq. Ft.
$5.80 - $6.20 / Sq. Ft.
$6.20 - $6.70 / Sq. Ft.
$6.70 - $7.30 / Sq. Ft.
$4.00 - $4.50 / Sq. Ft.
$4.50 - $5.00 / Sq. Ft.
$5.00 - $5.15 / Sq. Ft.
$5.15 - $5.65 / Sq. Ft.
$5.65 - $6.15 / Sq. Ft.
$6.15 - $6.75 / Sq. Ft.
$4.45 - $5.00 / Sq. Ft.
$5.00 - $5.45 / Sq. Ft.
$5.45 - $5.80 / Sq. Ft.
$5.80 - $6.40 / Sq. Ft.
$7.00 - $7.50 / Sq. Ft.
Why porcelain tile is more expensive to install than ceramic? Even though, ceramic and porcelain tile very similar in appearance there is a big difference in properties. Porcelain tile is much harder to cut and work with. In many cases for ceramic tile installation it is enough to have a simple tile cutter and may be a grinder for couple complicated cuts. But for installation of porcelain tile it is necessary to have a tile saw. 12" x 12" - 18" x 18"
$5.10 - $6.40 / Sq. Ft.
$5.60 - $7.10 / Sq. Ft.
$5.70 - $7.40 / Sq. Ft.
$6.50 - $8.10 / Sq. Ft.
$5.45 - $7.00 / Sq. Ft.
$6.00 - $7.50 / Sq. Ft.
$6.25 - $8.00 / Sq. Ft.
$7.00 - $8.30 / Sq. Ft.
$5.30 - $6.70 / Sq. Ft.
$5.70 - $7.25 / Sq. Ft.
$6.00 - $7.75 / Sq. Ft.
$6.75 - $8.20 / Sq. Ft.
$2.5 - $3.5 / Ln. Ft.
$15 - $41 / Sq. 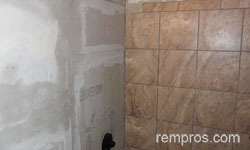 Ft.
All numbers in the charts are prices to install tile, apply grout and sealer if necessary excluding materials cost. If installer will buy thin-set or mortar as well as grout the price for installation will increase at $1.0 - $2.0 per square foot. All custom work will be estimated based on its complexity. Building shelves, installation of borders, or any other specific design as well as preparation work might double or triple the total price for tile installation. Why bigger tile is cheaper to install than smaller? Wider and longer tiles cover bigger area at a time and typically will be installed faster meaning reduction in labor cost. Other thing is it might be longer to apply grout when installing small tile. Why stone tile such as granite or marble are more expensive to install in comparison with ceramic or porcelain tile? Installation of stone tile such as granite, marble or limestone is a more precise and time consuming process. Using a good tile saw is essentially important while working with a stone. None of the stone tile can be cut with a tile cutter. It is also better to use higher quality (usually more expensive) thin-set to avoid problems with already installed tile later. Also unlike glazed ceramic or porcelain, stone tile require sealing after installation. In most cases marble tile will be around 20% more expensive to install than porcelain, and the difference will be even more noticeable if you compare ceramic and granite tile. How much did you spend or think it is a fair price to pay for tile installation?